This Babeezworld Mars baby stroller is a sturdy and spacious stroller, to give your child a secure and cozy feeling. It comes with a two pointed belt strap which ensures that your baby stays in place and does not come into harm's way. The straps come over both shoulders and around the waist. It sports a 3 -position reclining padded seat with an adjustable footrest to safely hold your baby. The Stroller comes with a removable music tray to keep your little one engaged as long as he wants to play. It is equipped with eight wheels. It has an extendable UV protective canopy as well, that shields your child from harmful sun rays. This baby stroller has a window cover and bottle bag and shopping basket at the rear that makes for convenient shopping, with your infant cozily enjoying it from. the Lounger. You can also place your mobile, keys and other small but important things, in the basket. 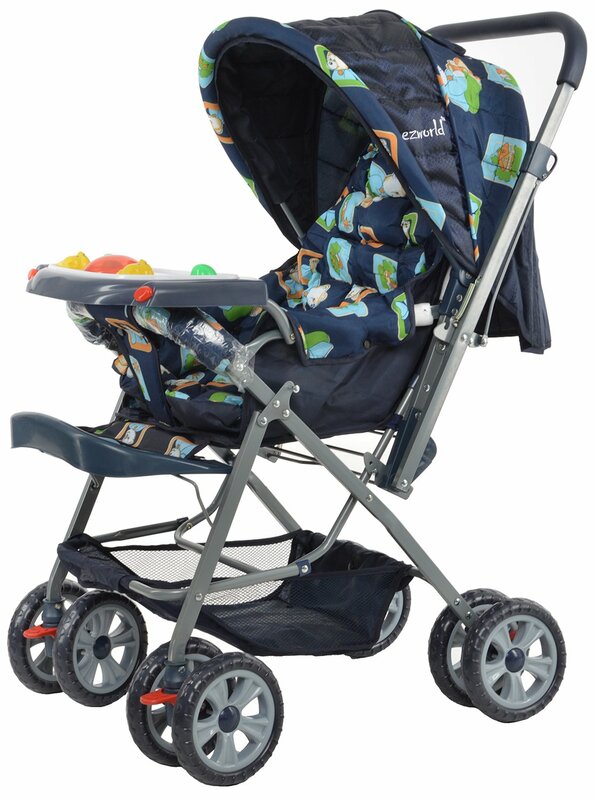 To Recieve updates and possible rewards for Babeez World Mars Stroller (Navy Blue) please sign in. To Recieve updates and possible rewards for Strollers & Prams please sign in.